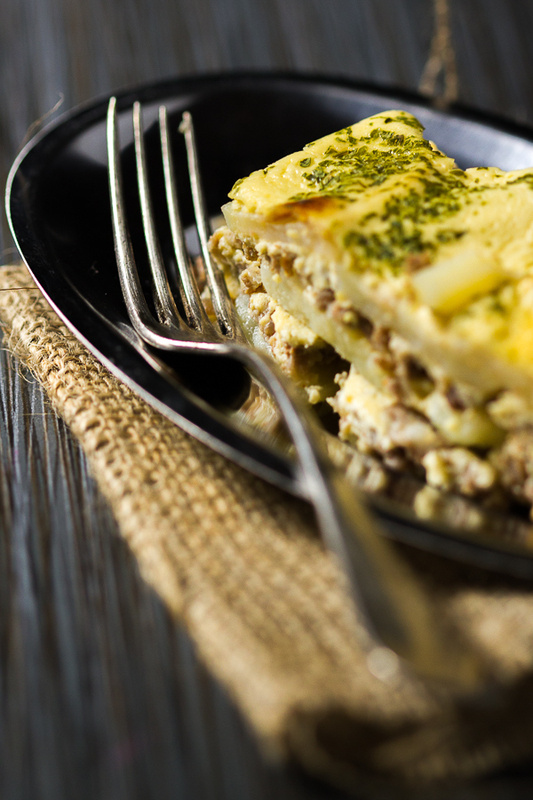 Moussaka is a casserole-type dish made by layering potato rounds and ground beef, which are then baked together and finished off with an egg, milk and sour cream topping. 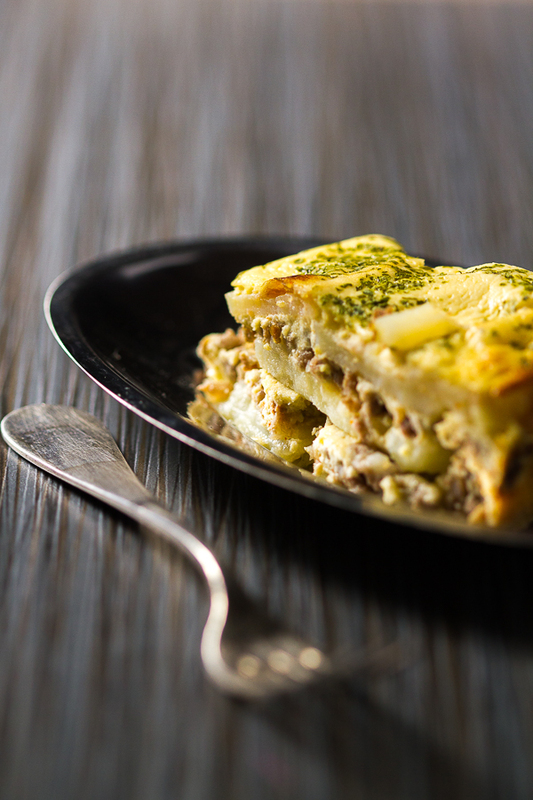 Many, many versions of moussaka exist. We’ll explore them together one by one. For now, I’ve chosen the easiest we can start with. Once you get the basics down you’ll easily substitute ingredients and decide what flavors you like the best. (You’ll hear me talk about the basics, because cooking is all about learning the basics. You learn your alphabet, and then you’re off to write novels. It’s no secret I’m unimpressed by casseroles. They scream lazy. Moussaka is the exception. 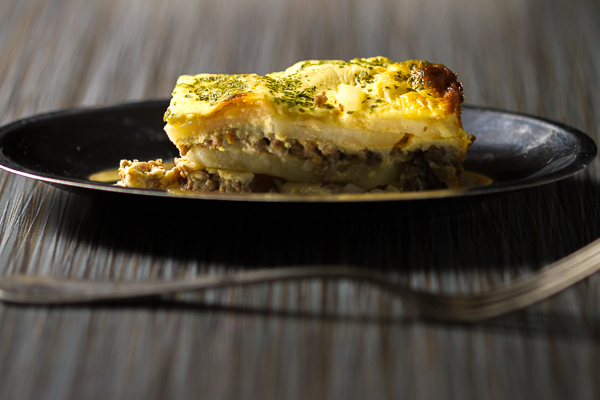 You’ll invest the same amount of effort and resources as you would into another casserole, but moussaka will taste better. And be easy on the eyes. Colleagues food bloggers know what I’m talking about here. These things aren’t the easiest things to photograph. 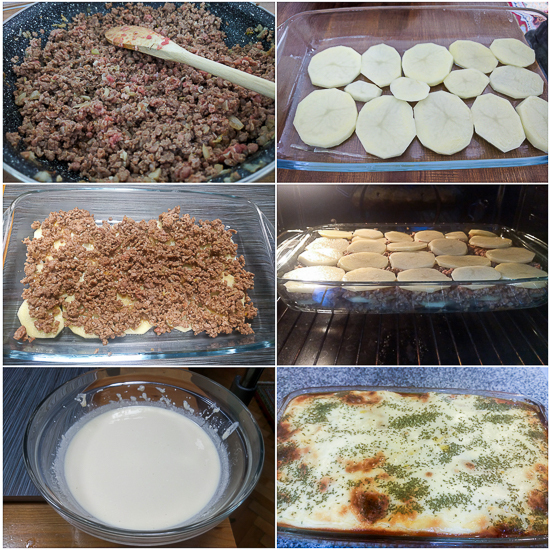 Moussaka is the first meal I learned to prepare on my own. It was after right college. I was living by myself, my family being an ocean away. Before that time I didn’t venture into the kitchen very often. My mom insisted I focus on studying instead of cooking, quite possibly due to having to clean up after my failed cooking experiments. But there I was on my own, having one of those moments when you have to have comfort food. Something reminding you of home. I called mom, and then sister, to ask for a simple recipe I could do. They both spoke in gibberish (ahem) experienced cook speak. You’ve heard this language before. What should I put into this? A little bit of this and a little bit of that. What temperature should I set the oven to? You first turn it up high, then you turn it down low. As a result those first few moussakas were unsuccessful. I tell you this because if you have any doubts about your cooking ability, give yourself a second (third/ fourth/ fifteenth) chance. To help you in this effort, I’m submitting this very specific moussaka recipe below. If you tried one of my moussakas today you’d lick your fingers. There is no reason why you can’t make one that’s even better. Heat oil in a deep pan over medium. Add onion and garlic and stir. After they crystalize, add ground beef and stir well. Simmer halfway until the meat is pink (but not red or brown). Remove off heat. In a larger bowl mix potatoes, oil and salt. Mix well with your hands. Place pan in the oven and bake for 40 minutes. In a large bowl, mix sour cream, eggs and milk until integrated. Take the pan out of the oven and top evenly with the egg/ sour cream/ milk mixture. Sprinkle with parsley. Return to the oven for another 20 minutes. ok – my 3rd attempt at Musaka – it was the best so far! Your easy to follow steps and photos made that possible. I have two Bosnian cookbooks that I picked up while in Sarajevo over the years and I ususally end up spending 1/2 the day translating the recipes. 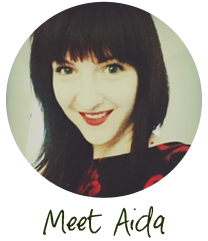 I Love, Love Love this website – it’s helping me so much! Thank You! Your words made my day! Glad you were able to make the musaka to your liking. If there is a specific recipe you need feel free to leave a comment, and I’ll see if I can whip up a good recipe for you. Thanks: just like my mom’s! 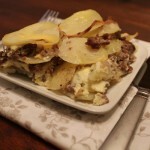 I used plain yogourt and extra lean ground beef instead of sour cream to cut down on the fat… delicious! Sabina, which type of yogurt did you use, and what brand? I have the hardest time finding yogurt that’s not Greek – the smooth kind you can drink. The closest I got to it was buttermilk, but it’s not the same. LOVE THIS RECIPE!!! But I also added a shredded onion white cheddar so amazing! Tons of flavor! My husband doesn’t often eat leftovers, this he LOVES! My mom used to make this for us growing up. So glad I was able to find this version because it reminds me of home so much! Hvala!!! Thank you for that comment, it really made my day. Enjoy the recipes and if you think of one you’d like let me know and we’ll put it in our rotation. Family loved this. I used smoked paprika ( little more than you) and thyme in the meat mixture and added nutmeg to the custard mixture. Served with mixed green salad and everyone loved it. Hoping to try the eggplant version next. That sounds lovely! Great call with the nutmeg, have to try it your way. Happy New Year!